One of the hottest gadgets to be launched at this year's CES has got to be the new tablet Motorola XOOM™. It is the first device running Google’s new Android 3.0 Honeycomb operating system designed from the ground up for tablets. The Motorola XOOM boasts a dual core processor with each core running at 1 GHz, delivering up to two GHz of processing power, and 10.1-inch widescreen HD display and is 4G LTE upgradeable. It supports 1080p HD video and HDMI output to display content on larger HD screens, and plays video and other rich web content seamlessly with Adobe® Flash® Player. The Motorola XOOM also features a front-facing 2-megapixel camera for video chats over Wi-Fi or 3G/4G LTE, as well as a rear-facing 5-megapixel camera that captures video in 720p HD. It delivers console-like gaming performance on its 1280x800 display. Other fantastic features include a built-in gyroscope, barometer, e-compass, accelerometer and adaptive lighting for new types of applications. The tablet comes with Google Maps 5.0 with 3D interaction and also access to over 3 million Google eBooks and thousands of apps from Android Market™. The Motorola XOOM will launch in the US with Verizon Wireless as a 3G/Wi-Fi-enabled device in Q1 2011 with an upgrade to 4G LTE in Q2. 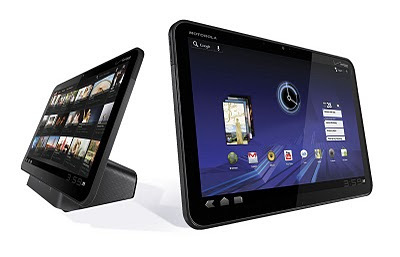 Starting in Q2 2011 the Motorola XOOM will be a 4G LTE/Wi-Fi- enabled device. No news regarding when the device will be available to consumers in the UK but I definitely want one.